We conducted our extraction on Wednesday hunched over under an overcast sky, catching papers, tubes, and foil as they blew away in the wind, and layering our gloves in a futile attempt to keep our hands warm. 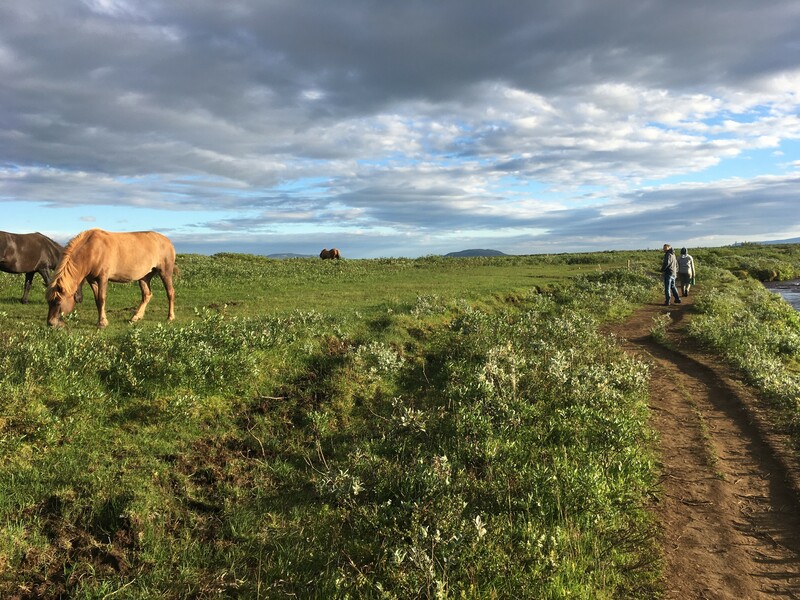 By contrast, our last day in the field gave us a fortunate change in the weather—the skies cleared, the sun broke through, and the wind dissipated. 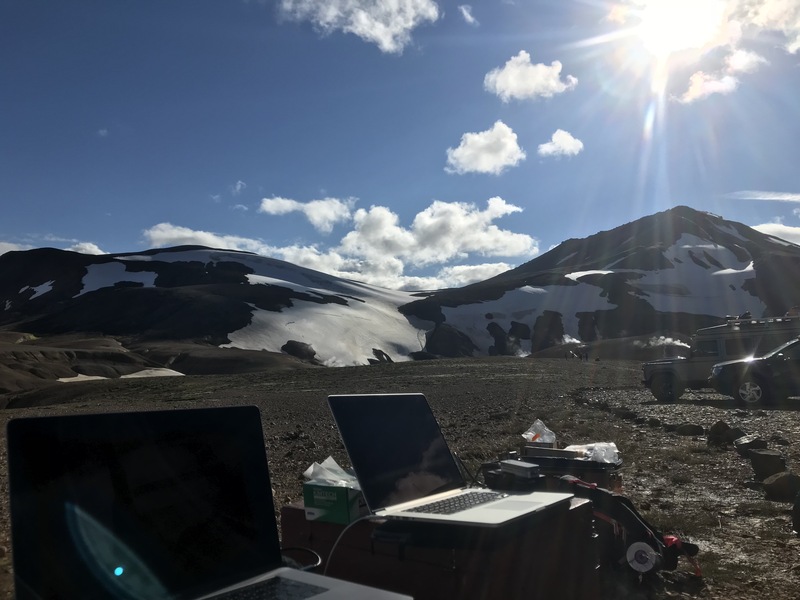 Thursday opened as half of our group set out early to begin a sequencing run at our field site in Kerlingarfjöll, and the rest of us arrived shortly after, the rest of our gear in tow. We arrived just in time to watch Maggie load our flow cell with our DNA from Wednesday’s field extraction, and we gazed on as the data begin to roll in and NanoOK started to return our analysis. With our sequencing run chugging along, we set up our “field lab” with a beautiful view. The top of our ridge was in full sun, and the light illuminated the snow packs on the surrounding mountains against the dark rock. Part of our group hiked back down into the valley, toward the glacial streams and their surrounding banks, to collect more samples. As they set out, we began preparing another round of field extractions. We used a modified PowerSoil kit protocol to extract DNA from the soil sample we used the day before—the same soil whose DNA we had begun sequencing in the morning. We also extracted from a newly collected sample from a similar site. 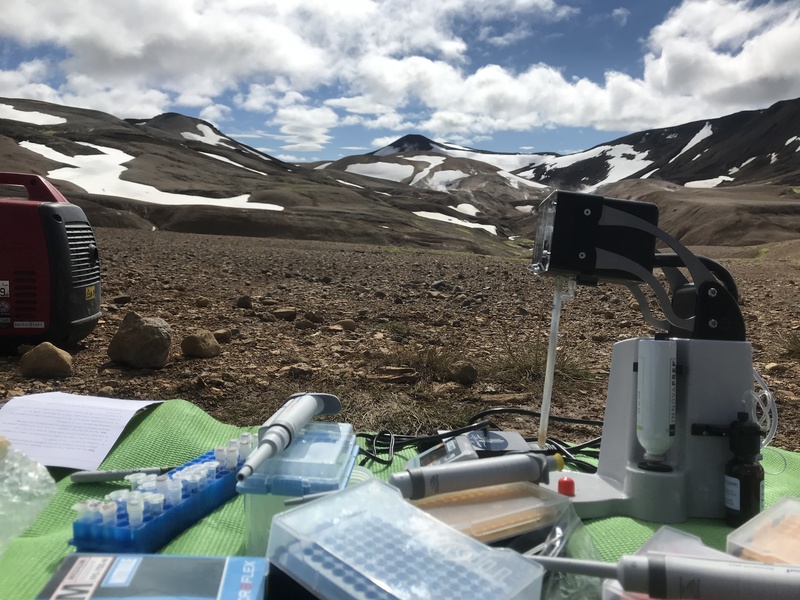 When the rest of our group returned, we concentrated a water sample from a glacial stream with our InnovaPrep concentrating pipette—in a matter of minutes, we had concentrated a few hundred milliliters into around 1 mL, some of which we were able to use in our extraction protocol alongside our soils. We worked through the protocol, swapping out instruments plugged into the generator to give each one enough power, and using field substitutions for some of the equipment we’d normally use in the lab. Once we had worked through our protocol, we prepped our DNA for quantification in order to see which samples, if any, were going to be viable for sequencing—and to check for contamination in our blank, which is an even bigger threat in the field. I don’t think I’ve ever held my breath so much or hoped so frantically that a blank would turn out clean as I did then—when our control didn’t show evidence of contamination, we felt comfortable moving ahead with our second field sequencing run of the day. We prepared the DNA library, like we did in the morning, using a newly developed kit for field sequencing, and we set up our MinION (wrapped in some felt, to stay warm!) to begin our run. After only about 30 minutes, we were able to look at the first analysis returned by the NanOK RT pipeline and get information about the bacteria in our sample in real time. After spending the summer running practice extractions and struggling to properly load flow cells, we were finally able to see our entire process laid out before us, in the field—from raw sample to analyzed data, in one shot. It was exhilarating and gratifying to see all of our efforts come together and give us information about our sample, and also about what experiments are possible in the field. As we drove back to the lodge, we tried one final test, just for fun—keeping one of our MinION runs sequencing on our laps as we drove over the bumpy dirt and gravel roads. We laughed about the MinION’s “road test,” and we were able to keep our sequencing run going during the trip back from our field site. While our sequencers ran through the evening, we packed our field equipment back into its suitcases. 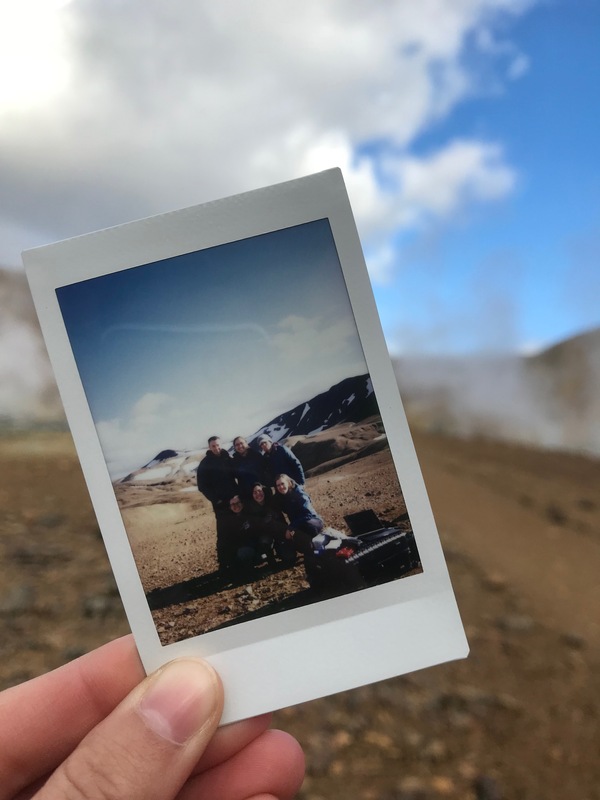 We set out the next morning for the long drive back to Reykjavik, and we crossed the Mid-Atlantic Ridge again, from the Eurasian plate to the North American, another step on our way home. 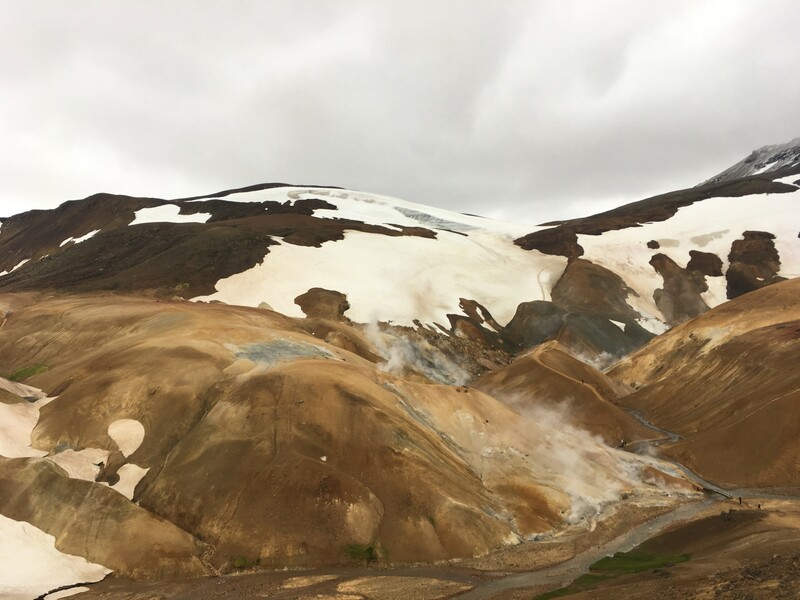 This entry was posted in Iceland 2018 on August 9, 2018 by Julie Bevilaqua.